If you don't read Telecanter's Receding Rules, you're missing out on a load of awesome. 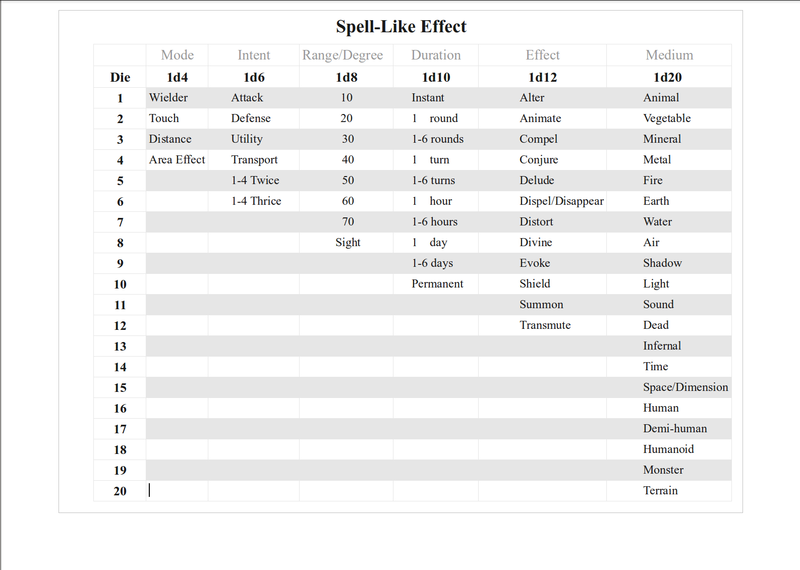 One of the great resources he has over on his page is a random table that generates "Spell Like Effects". The original idea was to generate a totally random daily effect for The Crown of Cedifer the Sullen. My Co-DMs and I decided to flip things around a bit, roll up a bunch of random effects, and then figure out a magical item based on what the dice decided. We had a surprising amount of fun, and every time someone got stumped by one of the results, someone else was able to come up with something that just... worked. Here's a list of the effects we rolled up, and you can find the items we created to fit these effects below the jump. The elements rolled for each line are: Mode, Intent, Range/Degree, Duration, Effect, Medium. A pair of yellow leather boots. If the expanse is too large for the cat to cross, it will either tell you, not shift when use is attempted, or, get to the spot in the lava it can get to then ask your party a riddle (success continues passage, failure does the opposite). Undecided. Acts as "Protection from Normal Missiles"
A few times a day when the wearer of this broach is attacked, a mirror image of the wearer is produced within 60"
The other end of the room connects to a small, treasure filled, area that's completely cut off from the rest of the world. A "bubble" in the rock. Think Agathion. The shadow looks into your eyes and says "I am going to kill you"